This is an old revision of this page, as edited by Ssbbplayer (talk | contribs) at 05:07, 22 March 2015 (→‎Climate: official wmo data for sunshine was originally in monthly amounts, not daily as hko gives up (less accurate as they take the value, divide it and then round it)). The present address (URL) is a permanent link to this revision, which may differ significantly from the current revision. The city of Nakhchivan (Azerbaijani: Naxçıvan) is the capital of the eponymous Nakhchivan Autonomous Republic of Azerbaijan, located 450 km (280 mi) west of Baku. The municipality of Nakhchivan consists of the city of Nakhchivan and the villages of Başbaşı, Qarağalıq, and Daşduz. It is spread over the foothills of Zangezur chain, on the right bank of the Nakhchivan River at an altitude of almost 1,000 m (3,300 ft). Armenian tradition claims Noah as the founder of Nakhichevan (the Naxuana of Ptolemy), and a mound of earth in the city is still visited by many pilgrims as his grave. See Tomb of Noah and Noah’s Mausoleum (Nakhchivan, Azerbaijan). It should be noted that Armenian literature of the 5th through the 10th centuries does not have an Ark story. It is not until the 13th century that the Ark legends began to appear in Armenia, and by the 14th century these stories became popular. 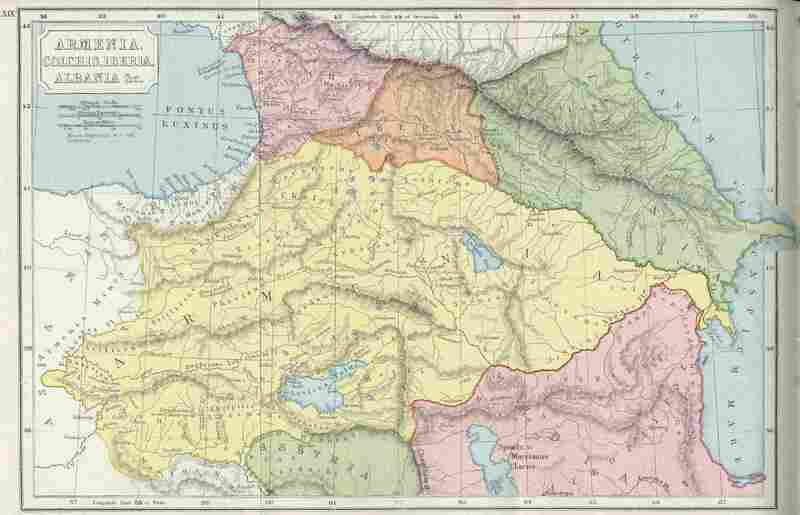 Nakhchivan was one of the prominent cities of the Armenian Kingdom under the Artaxides, Arshakides and Bagratides dynasties from the 2nd century BC until the 11th century AD. In the 2nd century, Nakhchivan was known to Ptolemy under the name Ναξουὰνα (Naxouana), and some scholars have sought to identify Strabo's otherwise unidentified Arxata, mentioned in his description of the cities of Armenia, with Nakhchivan. Herodotus wrote that the river of Araz flows from the mountains of Matean to the country of Nakhar. Potts writes that Nakhchivan was probably the capital of the Siwnik region of Sassanid Armenia during the late-Sassanid period, when Siwnik was described as being located "along the Araxes" by Ananias of Shirak. According to Sebeos, the Byzantine emperor Heraclius marched through the Nakhchivan region during his campaign against the Sassanid empire in 627-628. Some Armenian chroniclers additionally state that Heraclius destroyed the town of Nakhchivan before marching on to Ganzak. A legend that the city of Nakhchivan was founded by Noah developed during the Christian-era. At the beginning of the 12th century Nakhchivan became the capital of Atabek's state. At the start of the 20th century Nakhchivan was the capital of a district of Erivan Governorate of the Russian Empire. Nakhchivan in the early 20th century. During Nagorno-Karabakh War, the city like the region itself fell under a blockade.Although city's direct access to Azerbaijan is still blocked, they’ve increased connections with Turkey and Iran in recent years. During 1995 to 2012, Nakhchivan has undergone massive redevelopment with the region's GDP rising by a multiple of 48. Many of the city's cultural sites is expected to be celebrated in 2018 when Nakhchivan was designated an Islamic Culture Capital. The mausoleums of Nakhichevan was entered for possible inclusion in the List of World Heritage Sites, UNESCO in 1998 by Gulnara Mehmandarova — president of Azerbaijan Committee of ICOMOS—International Council on Monuments and Sites. 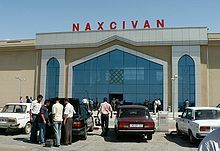 Nakhchivan has a large urban transport system, mostly managed by the Ministry of Transportation.In 2013, Ministry of Transportation stated that city, along with Ganja and Sumqayit will have new subway line within the framework of the 20-year subway program. Nakhchivan's trolleybus system at its height, it consisted of three lines and existed until 2004. Some of the city's many prestigious residents include: president of Azerbaijan Heydar Aliyev, Huseyn Javid — poet and playwright, founder of the progressive romanticism in Azerbaijani literature, writer Jalil Mammadguluzadeh, film director Rza Tahmasib, generals Huseyn Khan Nakhchivanski and Jamshid Nakhchivanski, artist Bahruz Kangarli and architect Ajami Nakhchivani. Heydar Aliyev, was longest serving political leader in Azerbaijan. Huseyn Javid, was founder of the progressive romanticism in Azerbaijani literature. ^ "NAKHICHEVAN, or NAKHJEVAN". jrank.org. ^ (in Armenian) Ter-Ghevondyan, Aram N. «Բագրատունիների Թագավորություն» (Bagratuni Kingdom). Soviet Armenian Encyclopedia. vol. ii. Yerevan, Armenian SSR: Armenian Academy of Sciences, 1976, p. 202. ^ D. T. Potts, "Some Problems in the Historical Geography of Nakhchivan" in Ancient West & East, Volume 1, No. 1, 2002. ^ Brockhaus and Efron Encyclopedic Dictionary: Erivan Governorate. ^ a b c d Hay, Mark. "How Environmentalism Can Foster Nation-Building". magazine.good.is. Retrieved 13 November 2014. ^ Hay, Mark. "Welcome to Nakhchivan, the San Francisco of the Caucasus Mountains". www.vice.com. Retrieved 13 November 2014. Wikimedia Commons has media related to Nakhchivan (city).